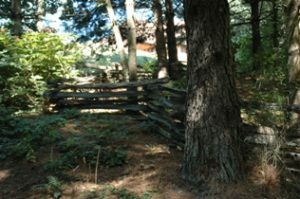 This trail leads visitors from the Bennett History Museum to the Native Garden area and then to the Appalachian Settlement. Depending on the season, you may see a variety of native plants. Native Americans and early settlers possessed confidence in the old-fashioned Indian remedies which used plants native to this region. Many of these plants were used for medicinal purposes and were thought to provide a remedy for various illnesses. Indians believe that when God made this earth, every plant had a purpose. The Trail is named in memory of Lou Reeta Barton Northcutt. Her father, James Monroe Barton, was a farmer and Methodist minister in Pine Log, Ga. He and his wife gave each of their 11 children $200. Lou Reeta and her brother, Eugene, put their money towards their education, and the family moved to Waleska so they could attend Reinhardt Academy. Lou Reeta graduated from Reinhardt in 1921, but she stayed on an additional year to study art and music. She spent 40 years in education as a teacher, assistant principal and principal. Though she and her husband never had children of their own, she loved and nurtured her many nieces, nephews and other family members. She loved Reinhardt, and on the eve of her 95th birthday, her family decided to honor her by donating funds for the Native Garden and Walking Trail at Reinhardt. Though she passed away in December of 2001, her memory lives on at the Funk Heritage Center. Dr. Joseph Kitchens, the first executive director of the Funk Heritage Center, worked with members of the Upper Etowah River Alliance, Cherokee Master Gardener and museum volunteers to surround the landscape of the Center with native plants. The Xeriscape includes plants that provide a water efficient landscape and are low maintenance. They are are drought tolerant reducing the need for irrigation. A grant from the Georgia Master Gardener Association provided funds to purchase plant identification markers used in the landscape. Dr. Kitchens said, "Plants native to Georgia are part of our heritage. This is a place where visitors can learn about them and understand how important they were to the Native Americans and early settlers. The natural walking trail may be used to educate children and adults and it adds another interesting venue to our museum." Each spring, several varieties of Trilliums are in bloom. Visitors may also see Wild Ginger, Foamflowers, Solomon's Seal, and Rue Anemone. Native Oakleaf Hydrangeas bloom in June, and many types of trees are also located on the Trail. 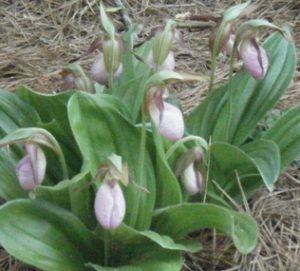 The lady slipper plant (Cypripedium acaule) pictured at the right is a protected plant species and it requires authorization to take, possess, exchange, transport, or sell. It also blooms in the spring and likes living in the shade. This is an example of the unusual native plants in our native garden.